Frugal Washington Mommy has teamed up with Living Frugal with Erika, BB Product Review, Missi Rose’s Coupon Spot, Shiny & New, The Mom Show, Sister’s Saving Cents, Thrifty Mom’s Reviews and More, Savior Cents, Miss Jackie’s Views, and All Things Abby to bring all of our fans this awesome giveaway! 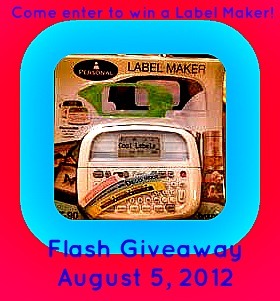 Enter to win a label maker that is valued at $30! Please be sure to visit all of the blogs involved and see what they can offer your family!! Do you want to win this Label Maker? Just use the RaffleCopter Form below to enter! Winner will have 48 hours to reply to winning email or another winner will be selected! Thanks for the cute flash giveaway! !